Location : North-Eastern coastline, approx. 2hrs drive from Sanur. 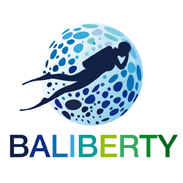 In the last 20 years, this local fishing village has become one of the most sought after diving destinations in the world thanks to the “Liberty” wreck which was sunk in 1942. The waters of the Bay of Tulamben are very rich in plankton following the southern currents from the Pacific to the Indian oceans. The volcanic geological nature of the area makes for a dark carpeted seabed which combined with a large density of plankton offers an average visibility of 15-25m. Being much less reflective than normal white sand it will give the photography enthusiasts an amazing background for contrast, enhancing the whole colour spectrum. Feast your eyes, there’ s going to be fireworks ! Remarks : from pebbles (beach) to a dark volcanic sand slope. Built in 1918 , this United States Army Transport vessel was specially equipped for WWII and used to convey goods (railway parts, rubber). Its days came to an end when torpedoed in 1942 by a Japanese submarine in the Lombok strait. In a failed attempt to tow the ship, taking too much water, it was finally beached at Tulamben so the cargo could be salvaged. In 1963 the eruption of Mount Agung caused the vessel to slip off the beach into the depths of Tulamben waters. open to all novice/experienced divers, snorkellers or free divers. Over the last 50 years nature has taken its course and the army vessel has become an amazing coral reef. Multi-coloured sea anemones, crinoids and vibrant corals are now local residents to this magestic “Liberty” wreck. Brace yourself for a world of wonders as you prepare for your night dive, particularly on a full moon : crabs, shrimps, crayfish, scorpion fish, Spanish dancers or even phosphorous plankton. Victim of its own success, the wreck can be host to an intimidating number of divers during peak season and specially between 09:00 and 15:00. If you can avoid that window you will surely be rewarded with tranquillity, comfort and fish volume ! Over the years the fauna behaviour has slowly changed, due to zealous divers and photographers feeding fish for the sake of a good shot. Near domesticated fish will come to you waiting for some bread or whatever you might have in store for them. So don’t be startled if you see a school of surgeon fish heading for your pockets and remember to act accordingly and responsibly. Located 10mns South-East of the wreck, this spot will please all photography enthusiasts. You will find here a great diversity and abundance in marine life at shallow depths (12m) and if you are thriving for the perfect shot, noon is the best time to be playing with colours and contrasts. The metallic plane structure lies at a depth of 6m creating a welcome habitat for local cardinalfish, angelfish and basslets. Be aware that this structure is very fragile and that holding onto it is not permitted … use your buoyancy, not your hands. Another artificial frame will be soon available as it has only been recently laid at 20m. The location and average depth of this dive site makes for an unforgettable night dive experience unveiling spanish dancers and phosphorous fishes. Remarks : from pebbles to volcanic dark sand. This site is a geological wonder due to an old lava flow from Mount Agung. The dark sandy slope takes you to the top of this underwater cliff plummeting down to 60 m.
Covered with different types of corals, the topography of the wall won’t cease to amaze you. The three main lava flows (named “the volcano fingers” by the locals) form a unique natural architectural frame for this site. From the “cleaning station” (18m) to the sumptuous 2m wide Gorgonian (30m), you will find similarities with the wreck and its fauna although not as rich. End your dive atop the coral plateau (5m) or surrounded by schools of fusiliers. Choose your timing carefully as the visibility (15-20m) will be better in the morning. Black-tip sharks, clown triggerfish, barracudas, napoleons, potato cods, blue-spotted stingrays, bump-head parrotfish, nudibranches, syngnates and scorpion-fish. Avoid this dive site during the monsoon (January to March) the reason being that a small river flows into the bay carrying its sediments and therefore considerably affecting the visibility (0-5m). Situated out of the Bay of Tulamben, to the south, this site is a 10mns Jukung ride (traditional balanced canoe). Three steep ridges form the back-bone (spine) of this underwater terrain sculpted with hard coral, gorgonians, fire coral and large sponge coral. “Batu Kelebit” is very different from other dive spots in Tulamben due to its fauna and carpet of white sand. The slope, ridge structure and plankton density combined offer an ideal environment for pelagic species such as barracudas, tunas, rays and white-tip sharks. Ascending currents bring up cold water so expect a drop in temperatures compared to the bay. Barracudas, napoleons, potato cods, sharks, tunas, manta rays.